Typhoid fever caused by Salmonella More Details typhi continues to be a major public health problem in developing countries and the incidence has been estimated at 540 cases per 100,000 of the population per year. The emergence of multidrug-resistant strains of S. typhi is known to be associated with significant morbidity and mortality. Equally recognized is the fact that a delay in diagnosis and institution of appropriate therapy may significantly increase the risk of adverse outcome and mortality. , Since the clinical presentation may not be specific; much onus falls on the laboratory for the rapid, reliable, and accurate early diagnosis of typhoid fever. The laboratory diagnosis directly depends on the day of illness and the investigation sought. Blood cultures carry 70-75% of diagnostic yield in the first week of illness and are still regarded as the gold standard for diagnosis  However, the delay in results stands inevitable. Rapid dot enzyme immunoassays have been tested and being used widely world over from a few years with varied results. ,,, Test is based on the presence of specific IgM antibodies to a specific 50 kDa outer membrane protein (OMP) antigen on S. typhi and becomes positive as early as in the first week of the fever, the results can be interpreted visually and available within one hour. To widen the clinical awareness, the study was undertaken with the objective to evaluate the sensitivity and specificity of the typhidot assays with blood cultures in the diagnosis of typhoid fever in our set-up. Out of 186 patients, 50 (64%) were culture positive for S. typhi (Group I) with 50 of the 50 tested positive for typhidot. Blood cultures also grew other organisms (Group II) - 22 isolates were identified as S. paratyphi, 4 were identified as S. typhimurium, and 2 were identified as E. coli and all of these 28 patients were typhidot positive. Blood cultures remained sterile and typhidot stood negative in rest of the other samples from patients with febrile illness (108). With the 2 × 2 table, the sensitivity of typhidot in relation to blood cultures was 100%, specificity was 95.5%, positive predictive value 89.2%, and negative predictive value 100% (22 patients with S. paratyphi A in blood culture were excluded in this analysis). Eleven patients (Group III) neither grew S. typhi nor were typhidot positive, but were treated on clinical evidence and recovered. 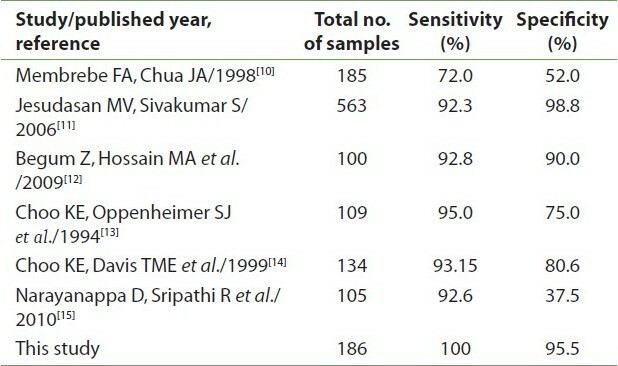 [Table 1] depicts the results of the study. Based on the results, typhidot was found to be having maximum sensitivity (100%) and good specificity (95.5%). However, cross-reactions with S. paratyphi A (28.2%) were documented and regarded as inevitable. Bearing this on mind, our results show that there is 89.2% probability that the patient gets diagnosed as typhoid fever when tested by typhidot. Predictive value for a negative test was computed at 100%, which means given a negative typhidot, there is a 100% probability that the patient has no typhoid fever. Blood culture was found out to be positive in 75.7% of cases based on our criteria of clinical typhoid and none of the 11 cases were positive by typhidot. Results stand in liason with most of the published data over a decade worldwide as quoted in [Table 2]. Turn around time is less than one hour when compared to 1?2 days for blood cultures. Despite the time, blood cultures accompany sensitivity testing too, and thus enjoy the status of preferred choice in this decade of changing susceptibility pattern of Salmonella isolates. Our results support that laboratories could easily employ this rapid, economical test with no expert technical skill, apt for developing countries, or at field. In the multi-step approach to decrease the incidence of typhoid in tropical countries such as proper sanitation, safe drinking water, newer vaccines, and so on, early diagnosis and treatment also figures out prominently and typhidot could come in handy at the diagnostic laboratories. Typhidot (Ig M) at our set-up showed high sensitivity and specificity and can be considered as the test of choice for the diagnosis of typhoid in today's rapid diagnostic era. Though blood culture continues to enjoy the status of a time-tested reliable gold standard, typhidot nonetheless can be used for the rapid and accurate diagnosis of typhoid fever in the typhoid endemic tropical countries. 1. Jelinek T, Nothdurft HD, Sonnenburg FV, Loscher T. Risk factors for Typhoid fever in travelers. Journal of Travel Medicine 2006; 3:200-3. 3. Hoffman SL, Punjabi Narain, Rockhill RC, Sutomo A, Rivai AR, Pulungsih SP. Duodenal string capsule compared with bone marrow blood and rectal swab cultures for diagnosing typhoid and paratyphoid fever. J Infect Dis 1984; 149:157-61. 4. Ismail A, Kader SA, Ong KH. Dot enzyme immunosorbent assay for the serodiagnosis of typhoid fever. Southeast Asian J Trop Med Pub Health 1991; 22:563-6. 5. Lu-Fong M, Ludan AC, Martinez MM, Raymundo JG. Dot EIA (Typhidot): An aid to the diagnosis of typhoid fever among Filipino children. Malaysian J Child Health 1999;8:163. 6. Olsen SJ, Pruckler J, Bibb W, Thanh NTM, Trinh TM, Minh NT, et al. Evaluation of rapid diagnostic tests for typhoid fever. J Clin Microbiol 2004; 42:1885-9. 7. Collantes E, Velmonte AM. The validity of the typhidot test in diagnosing typhoid fever among Filipinos. Phil J Microbiol Infect Dis 1997; 26:61-3. 8. Koneman EW, Allen SD, Janda WM, Schreckenberger PC, Winn WC. Color Atlas and Textbook of Diagnostic Microbiology. 5 th ed. NY: Lippincott; 1997. 9. Harrison's principle of Internal Medicine: Salmonellosis. In: Fauci AS, Brawnwald E, Kasper DL, Stephan L Hauser, Longo DL, Jameson JL, et al. 17 th edition. Part 7. US: Infectious Diseases Mc Graw Hill companies; 2008. 10. Membrebe FA, Chua JA. The clinical utility of typhidot in the diagnosis of typhoid fever. Phil J Microbiol Infect Dis 1999; 28:1-4. 11. Jesudason MV, Sivakumar S. Prospective evaluation of a rapid diagnostic test Typhidot for typhoid fever. Indian J Med Res 2006; 123:513-6. 12. Begum Z, Hossain MA, Shamsuzzaman AK, Ahsan MM, Musa AK, Mahmud MC, et al. Evaluation of Typhidot (IgM) for early diagnosis of typhoid fever. Bangladesh J Med Microbiol 2009; 3:10-3. 13. Choo KE, Oppenheimer SJ, Ismail AB, Ong KH. Rapid serodiagnosis of typhoid fever by dot enzyme immunoassay in an endemic area. Clin Infect Dis 1994; 19:172-6. 14. Choo KE, Davis TM, Ismail A, Ibrahim TA, Ghazali WN. Rapid and reliable serological diagnosis of enteric fever: Comparative sensitivity and specificity of Typhidot and Typhidot-M tests in febrile Malaysian children. Acta Tropica 1999; 72:175-83. 15. Narayanappa D, Sripathi R, Jagdishkumar K, Rajani HS. Comparative study of Dot Enzyme Immunoassay (Typhidot-M) and Widal test in the diagnosis of typhoid fever. Indian Pediatr 2010; 47:331-3.